Park Billow, 27, sprays water on the hot spots in his backyard as the Woolsey Fire burns in Malibu, Calif., Friday, Nov. 9, 2018. Authorities announced Friday that a quarter of a million people are under evacuation orders as wind-whipped flames rage through scenic areas west of Los Angeles and burn toward the sea. THOUSAND OAKS, Calif. – California is on fire again, north and south, the flames deadly and swift, fanned by ferocious Santa Ana winds and fueled by dry tinder. The fires have killed at least nine people, immolated a mountain town and jangled the nerves of many tens of thousands of residents forced to evacuate their homes. The fires have thus far proved to be unstoppable, operating at flash-flood velocity. The big wildfire here in Southern California, known as the Woolsey Fire, quadrupled in size Friday, covering more than 22 square miles, with no containment. It easily jumped eight-lane Highway 101 and rambled over the Santa Monica Mountains to posh Malibu, where it torched homes and cars. The wildfire then finally ran into its only match so far: the Pacific Ocean. The bulletins from the northern part of the state were even worse. At least nine people died in or near their homes or vehicles as they tried to outrace the Camp Fire, which devastated the mountain town of Paradise, about 90 miles north of the state capital, Sacramento. Paradise was anything but, with block after block of destruction, downed power lines, charred cars in the middle of roads, utility poles still smoldering and spot fires around the town, though there wasn’t much vegetation left to burn. Random buildings still stand in the town of 27,000, but for every edifice that survived, dozens that did not. Marc Kessler, 55, a science teacher at one of Paradise’s middle schools, said the smoke was rising from the Sierra Nevada foothills when he arrived at work Thursday. Kessler said authorities told teachers to forget seat belt laws and start piling the 200 or so students who showed up for class Thursday morning into the teachers’ personal vehicles. Some frantic parents showed up to get their children, he said, and bus drivers drove through flames to help save children’s lives. About 23.4 million Californians were under red-flag warnings into Friday, and officials warned that flames could reach the city of Chico, a college town of more than 90,000 about six miles from Paradise. People scrambled to evacuate. The Camp Fire had covered 110 square miles and was just 5 percent contained as of Friday, state officials said, warning that there might be additional deaths that they cannot confirm until they can safely enter smoldering neighborhoods. It is a terrifying situation for family members of residents who were last heard from when the town and others nearby were ordered evacuated. California has experienced debilitating fires of unprecedented regularity in the past few years, many of them encroaching on towns and cities built up to the edges of forests in areas prone to wildfires. In August, the Mendocino Complex Fire became the largest wildfire ever recorded in the state, burning more than 400,000 acres. 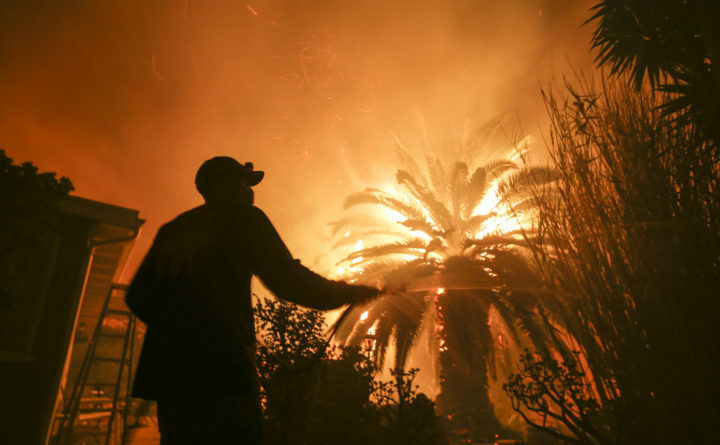 The previous record was set less than a year before, when the Thomas Fire burned through more than 280,000 acres in Ventura and Santa Barbara counties. In October 2017, some 21 wildfires burned nearly 95,000 acres and 7,000 buildings in Sonoma and Napa counties in the heart of California’s wine country, killing 40 people. The California fire season normally begins in late spring and lasts through summer. But hot, dry weather has persisted this year well into autumn, and the winter rains have yet to arrive. The Santa Ana winds, which blow out of the Sierra Nevadas and toward the western coastline, are building into howling gales that dry the vegetation and the soil, creating potentially explosive fire conditions. In Thousand Oaks, 40 miles from downtown Los Angeles, residents have endured a brutal week. This city, cherished by its residents for clean air and low crime, already was in mourning after Wednesday night’s mass shooting at a country music bar. At a vigil downtown Thursday night, people had lit candles and pondered an unspeakable crime. Just hours later, the same area was choked in smoke and imperiled by the Woolsey Fire. In the pre-dawn darkness, a gusty wind whipped American flags flying at half-staff in honor of the shooting victims. An orange glow could be seen throughout the city, sometimes leaping into bright flares along the ridgelines. Emergency bulletins buzzed cellphones in the middle of the night, sometimes urging evacuations. “It’s dangerous to sleep all night,” said Sergio Figueroa, 34, who was dropping his wife off at a hotel where she works on Friday. Late Thursday and into the early hours Friday, he watched television, knowing his home was in the “voluntary” evacuation zone. He said he allowed himself one hour of shut-eye – but not actual sleep. “You just close your eyes and stay alert,” he said. At 3 a.m., streets normally empty at that hour were filled with parents, children and pets evacuating as the orange glow crept closer. “Don’t wait too long. Get out when they tell you to get out,” said Uber driver Brent Young, 52, who was about to take a client from Thousand Oaks to the Los Angeles International Airport through a roundabout route that would circumvent closed freeways and dangerous conditions. The problem was figuring out which way to go. There were fires in many places. Even before the Woolsey Fire kicked up, another wildfire, the Hill Fire, threatened homes west of town. Highway 101 was closed in both directions at various times for two different fires. The only thing inhibiting the Hill Fire was that it ran into the footprint of a 2013 fire and lacked fuel, officials said. Longtime resident Peggy Smith, 64, was filling her gas tank at 4 a.m. Friday at a Mobil station in an area under voluntary evacuation. She said people began flocking to Thousand Oaks in the 1960s after airline pilots on the flight path into Los Angeles noticed that there was no smog here. The pilots moved in, and then police officers, and firefighters. She was ready for the fire. She needed only 10 minutes to load her car with her favorite family photos, important documents, clothes and food. They were busy. The trucks rolled through neighborhoods and zoomed down Highway 101. People had fled, power was out, and the only light came from the fires. Wendy Eldredge, 54, drove to work as always, to Noah’s Bagels, close to the freeway, aiming for a 5 a.m. arrival so doors could open at 6. When she topped a hill and looked down into Thousand Oaks, she was stunned. She drove in to work and opened up, the only employee in just about the only place for miles open for business. “I didn’t want to let the people down,” she said. Dawn arrived with a pall of smoke blotting out the sun. The Woolsey Fire came from the north, not in a single wall of flame but in leaps and bounds. Smoke loomed over Thousand Oaks like a thunderhead, the black cloud slowly advancing toward the sea as it crossed hills covered in blackened stubble. In Malibu, film and television producer Ben Rosenblatt, 35, took one look at the approaching fire and knew he had to get out fast. He had just enough time to walk the dog first. There aren’t many ways in and out of Malibu, with the roads that wind up through the canyons impassable because of fire. That left the Pacific Coast Highway, where traffic moved at a crawl. The drive to Santa Monica should have taken him 35 minutes, but the navigation app on his phone said it would be 2 hours 35 minutes. Back in Thousand Oaks, the smoke would recede and then billow up again as a spot fire flared anew. At a teen center, set up as an evacuation site for those fleeing the fires, people became nervous when they saw flames on a nearby hillside. In the parking lot, people slept in their cars beside their cats and dogs, their belongings packed in the back. Mary Leighton, 57, of West Lake, had just gone to bed Thursday night when her brother heard on the news that they needed to evacuate. Five minutes later, carrying her husband’s ashes and her cat, Pumpkin, she and her family were gone. They slept in a shelter overnight and woke Friday morning to news that homes in their neighborhood had burned. Leighton didn’t know whether her home survived. She and her family didn’t get cots at the shelter until 4 a.m., she said. Leighton slept until 9 a.m. and woke to figure out a plan for what comes next. She had been sitting in a white Volvo in the parking lot all morning, still wearing her pajamas. Williams, a freelance journalist based in California, reported from Paradise, California. Bever reported from Washington. The Washington Post’s Katie Zezima in Thousand Oaks and freelance journalist Noah Smith in Santa Monica, California, contributed to this report.